I had my first "official" family portrait session and it was a large one at that. 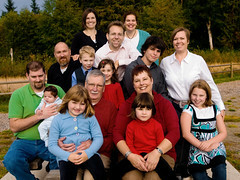 A co-worker asked me to take some outdoor family portraits of his family and his sister's families. It was a challenge shooting 8 adults and 7 kids. Some of my favorite photos were the candids that were taken if the kids playing after the formal shots were done. A big thanks to Mark for assisting me on the shoot. The weather turned out to be great. It was a nice rain free cloudy day so there was no harsh sun to have to deal with. I doubt I will be doing this on any kind of regular basis but would consider doing it again if it were for a friend. It's a lot of work, especially for a group this big. The post processing was the most time consuming, but it was fun.